As a heavy smoker, he needed some fairly robust smoking accessories, and we first learn of James Bond’s lighter in Casino Royale, when Ian Fleming described it as an oxidised Ronson. In Moonraker the Ronson is further described as black-oxidised and in From Russia, With Love as battered. It was also in this book that Bond is introduced to “Captain Nash” by the coded exchange shown in the graphic at the top, which was changed only slightly for the 1963 film. In The Spy Who Loved Me Vivienne Michel describes Bond’s Ronson as being “gunmetalled like his case” rather than oxidised, but perhaps her recall was affected by the events that took place at the Dreamy Pines Motor Court that night. I had always assumed that the oxidisation was simply due to its age, or perhaps overuse. However, better authorities on such things than myself have suggested the lighter oxidisation may be deliberate to blacken the surface. Ronson was not the only make of lighter used by 007 though. 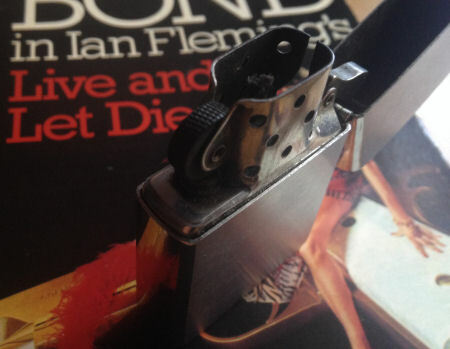 In Live And Let Die Bond went under a certain amount of Americanisation at the hands of the FBI, including switching to Chesterfield cigarettes; he also carried a plain Zippo lighter with which to light them. In Doctor No he manages to pocket a silver table lighter prior enduring the obstacle course, although since this was not used for lighting his cigarettes it doesn’t really count. And in You Only Live Twice when disguised as a miner Bond carries matches. Which model is the James Bond Ronson lighter? There have been numerous attempts to identify the exact model carried by James Bond, but the problem is that Fleming’s description is just too vague. Like the black gunmetal cigarette case, Bond’s choice is probably that of Ian Fleming; if we could find out that piece of information I’m sure we would be much closer to the truth. Possible contenders would seem to be the Ronson Standard, first manufactured in 1928 and produced in dozens of different designs, but also the Adonis from 1947 and several others that fit the time period (see this website for details). 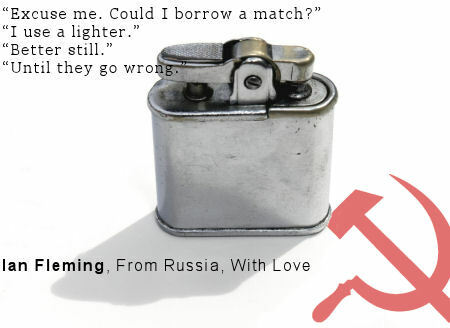 The example shown at the top of the page is a Ronson Whirlwind, first introduced in 1941 and which included a windshield that could be extended from the body of the lighter for use outdoors; handy on the golf course, where Bond is to be found regularly, but really there is nothing to identify this 100% as the James Bond Ronson lighter. Affordable vintage Ronson lighters are available on eBay, while you can pick up Zippos easily, including from Amazon UK and Amazon.com.